John Edward Addicks' persistent effort to win a seat in the Senate ultimately had some positive results for politics on both the state and national level. A constitutional amendment would take the appointment of senators out of the hands of state legislators and make the decision one made by the state's electorate as a whole, and black voters would become a more influential part of Delaware's democracy. Yet Addicks' contribution to these advances was ultimately an unintended side effect of a corrupt campaign which frequently paralyzed the state's legislature and forced Delaware to go without representation on the national scene. Addicks was born in Philadelphia in November of 1841. He worked as a clerk and errand boy before becoming a partner in a flour business. Addicks suffered a setback in the Panic of 1873, but managed to recover. He further diversified his business dealings by becoming involved in wheat and railroad markets, but he would become a millionaire mainly by investment in the illuminating gas industry. Boston was his key market, and he did extensive business in other cities as well; in 1883, he was one of the financial backers for the new gas works in Chicago. Addicks' first association with Delaware came in 1877. He bought a residence in Claymont, a community on the border with Pennsylvania that allowed him to commute easily to Philadelphia. Addicks later moved to Boston after his business dealings as the president of the Bay State Gas Company required him to spend more time there. He continued to hold the Claymont house as a summer residence, but for all intents and purposes it seemed he was a Massachusetts citizen. So it came as quite a surprise when Addicks announced in 1889 that he was a Republican candidate to represent Delaware in the Senate. He joined three candidates in the race for the nomination, declaring that his opponents would compromise the Republican Party. "It is a sort of Kilkenny cat fight, and the election of any one of them would imperil Republican supremacy in the state," he said. "A new man is needed to hold the state, which I regard as the first step toward breaking the solid South. I am greatly interested in the success of the Republican Party and I feel that by my election Delaware can be kept a Republican state, while the election of any one of my opponents would make its retention very uncertain on account of their relation to the factional interests in the party." Addicks was unsuccessful in this attempt, but it was only the first in a series of Senate bids where he would use his wealth and influence to try to buy his way to Washington. One of his most common tactics was paying the delinquent taxes of voters or else covering the poll tax in exchange for political support. With the state legislature the ultimate power behind choosing the Senate representation for Delaware, however, Addicks focused much of his attention on buying the support of legislators with thinly-veiled bribes. In 1892, it was alleged that he funded the campaign purses of several legislators to support his latest Senate bid. Many received $8,000 sums, four times the amount allowed for political campaigning, with the implication that they could max out their campaigns and keep the balance for themselves. Yet ultimately these efforts fell short of the majority needed to win the legislature's favor. One of the most turbulent years occurred in 1895. Governor Joshua H. Marvil died in April, less than three months after he was sworn into office. The state senate's president, William T. Watson, replaced Marvil as governor. By this point, Addicks had gained a significant following of "Union Republican" followers to counterbalance the "Regular Republicans" uncorrupted by his influence. Watson's departure from the state senate left the Regulars with a single vote majority in support of their candidate: Henry du Pont, a businessman who had won a Congressional Medal of Honor for his service in the Civil War. Yet Watson was persuaded to return to the senate to cast his vote for Addicks, deadlocking the decision 15-15. Ultimately, du Pont would travel to Washington to try to take his seat on the argument that Watson's vote was null and void, but the Senate didn't accept him; one of Delaware's two seats would remain vacant. It wouldn't be the last time that Addicks' efforts would stymie the state's representation. For over a decade, Addicks' machinations would occupy much of the legislature's business. Deadlock in the legislature meant that Delaware failed to appoint a senator in 1899, 1901, 1903, and 1905; between 1901 and 1903, neither Senate seat from Delaware was filled. The strength of the Regular Republicans was enough to prevent every effort to appoint Addicks, but he came close on some occasions. In 1899, he received 21 of the 27 votes needed for the seat. Two years later, he had 22 votes. One article charged that Addicks tried to solidify his support in the legislature by covering the poll taxes of 130 of 134 registered black voters in Kent County and 258 out of 260 in Sussex County in 1902. 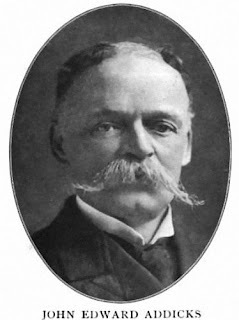 "Other men have bought votes now and then on a small scale, and other parties have resorted, occasionally, to tricky or dishonest methods; but no systematic attempt was ever made to corrupt the whole population and buy up the whole State until J. Edward Addicks and the Union Republican party took the field," George Kennan wrote in an account of Addicks' activities for Outlook Magazine. "'Addicks or nobody' for their war-cry, they began a campaign of corruption which has no parallel, I believe, in the history of the United States." Kennan said Addicks was displeased enough about spending large amounts of money with no result that he sent a telegram to William Washburn, a former Republican senator from Minnesota, that showed he had little loyalty to the party. "The Republican Party will carry Delaware next year pledged to Addicks for Senator. I made Delaware Republican," Addicks ranted. "If the Republican Party is the party of treachery, I will bury it ten thousand fathoms deep." Overall, Addicks spent about $3 million on his unsuccessful campaigns. Shortly after the start of the 20th century, his political aspirations were waning. The New York Times reported in September of 1905 that he was becoming a political obscurity, with supporters deserting him. Addicks still had some fight left, however. He said in 1907 that he was considering running for mayor of Wilmington, and four years later announced that he would try to challenge the legislature's election of his old rival, Henry du Pont. He quickly withdrew when it became clear that the deadlock over du Pont was not as serious as he thought. The vacant seat left in 1905 had prompted the legislature to elect du Pont to the Senate in 1906, and he was re-elected in 1911. State reforms aimed at addressing the corruption included the establishment of a secret ballot and elimination of the poll tax. Both had the secondary effect of scoring a victory for civil rights and empowering black voters. In 1901, the the first black candidate was elected to the Wilmington City Council. Cases like that of Addicks and William Lorimer of Chicago also made it clear that state legislatures were far more vulnerable to corrupt bargaining than the general electorate. In April of 1913, the Seventeenth Amendment was ratified and Senate elections went to a popular vote. Addicks fell on hard times in his waning years. Once worth between $10 and $15 million, he lost much of his fortune when his investments in the copper market didn't pan out. No stranger to lawsuits, Addicks ignored a summons to appear in court for further proceedings after Hiram H. Burton of Boston won a $20,000 judgment against him. Subsequently, Addicks was arrested in New York City for contempt of court. Two years later, he was again jailed for contempt after prolonged efforts to elude the authorities by only going to the city on Sundays, when he could not be served with papers. Addicks died in August of 1919.